"It became necessary to destroy the town desert to save it"
The event website now features an interactive floor plan allowing you to see who is exhibiting by area of the convention center. Collector Day (Sat 10am–4pm) featuresRaquel Alonso-Perez, Curator of the Harvard Mineralogical & Geological Museum, who will present "Over 200 Years of the Harvard Mineral Collection"
Also on Sunday evening, we're told that Pala International president Bill Larson will receive Mineralogical Record's fourth annual American Mineral Heritage Award; prior recipients are Ed Swoboda, Wayne Thompson and Bryan Lees. Get down. Pala International's Will Larson is included in Westward Look's Sunday night presentation, "Fine Mineral Collecting and the Second Generation." Above, Will stands in an old main drift (tunnel) of the Esmeralda Mine in San Diego County's Mesa Grande District. See more on Pala's mining blog. For ten years, a sleeping giant had undergone a meticulous face-lift. Finally, last November, Pala International received an invitation to the long-awaited opening of the mineralogical and geological hall (Galerie de Minéralogie et de Géologie) at the Muséum national d'Histoire naturelle in Paris. This is the same museum that Carl Larson works at part-time in gemological pursuits such as browsing the collection of René Just Haüy (see "An American in Paris"). Fortunately, Pala's president Bill Larson was able to adjust his busy schedule and attend the opening. 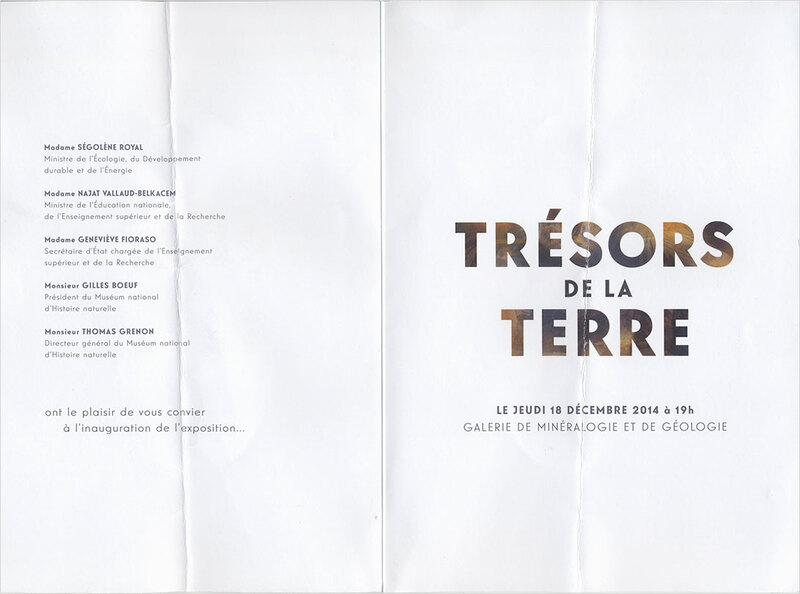 His reflections regarding the hall's inaugural exhibition, "Trésors de la Terre" (Treasures of the Earth) follow. My various Paris curator friends at this museum—François Farges, Cristiano Ferraris and Giancarlo Parodi—have been working on this new exhibition hall for several years now, so I was excited to see the museum reopen its rich mineralogy history to the public. The date worked for me: December 19, an evening opening. I soon found out that a couple of good friends from outside France would attend, among them Raquel Alonso-Perez (Curator of the Harvard Mineralogical & Geological Museum), Wayne Leicht (dealer in fine minerals from USA) and Alan Hart (Head of Earth Science Collections at The Natural History Museum, London). So I booked my trip. Five days in Paris in December is not difficult to plan. I also asked Patrick Dreher, the famous carver, if he'd like to come down from Idar-Oberstein and he said that would work out fine. We had several projects to discuss together, so that was a great excuse to meet up. My first itinerary item was to look at a private gem collection on Monday; Raquel was invited as well. On Tuesday, Raquel, Alan and I were invited to lunch with the famous John Saul whose writing has been discussed in these pages [see the tanzanite monograph published by Mineralogical Record and mention of his 2014 book A Geologist Speculates]. The luncheon was excellent. We were able to go over a lot of East African history with John who had first-hand information which was very useful for both the curators in our party. We set up to meet again at the opening of the museum on Thursday. Poised. The Dreher family has been carving gemstones for five generations. GIA students and the general public will have the chance to view their oeuvre courtesy another family—Pala International's Larsons—who are loaning Dreher examples from their personal collection for a special exhibition. Generations of Mastery: Gemstone Carvings by Dreher opens February 19, continuing through summer 2015. On Thursday morning, Patrick was able to arrive. He and I joined up with Raquel and Alan for lunch at which he showed them some of the work he was doing for us at Pala International. One of the projects is to bring Patrick over to GIA for a lecture and an accompanying exhibition for students and the interested public of the fantastic natural beauty carved in gemstones by his family [see caption of the above image for details]. The afternoon consisted of a visit by the four of us through Place Vendôme to look at the various famous jewelers' windows filled with different designs of colored-stone and diamond jewelry. We found the most curious piece was in Buccellati's: a matched pair of large fine pink gems mounted in earrings. Well we all guessed wrong at first. Alan went inside and and found out they were kunzite. No one thought that kunzite would be on display in the sun. But perhaps these windows had UV protection. The next order of business was to meet up at 7 o'clock for the opening! We arrived on time and saw that there was a large crowd of well over 100 people already. In the old museum display area there was a podium set up and, as you see on the invitation above, a few speeches were given. With the ribbon being cut in a timely fashion we were given numbers for entry so the crowd could work its way through and would not be pushing. The first thing that was obvious was that the great collection of crystal giants created a central theme around which the various displays had been set up. I found one of the most interesting displays was demonstrating that minerals had been used as powder to create pigments for painting and they had many examples. Obviously, many people know that azurite powdered is used for blue watercolor, but they had many others, with turquoise and malachite well represented. As one went around the central giants we came onto the gemstone collection, many of which are quite historic. The most famous to me of course is the 135-carat parallelogram blue sapphire, which my son Carl was involved in the study of this past October. Like the French Blue (now the Hope Diamond) this belonged to Louis XIV but it is almost unknown to most Americans. With the new forms of communication hopefully this fabulous piece will now take its place as an important historic gemstone. As we continued our viewing of the new hall we came across a large case of golds which should be a crowd pleaser. Also continuing in the gemstone area, we took in a few superb minerals from the famous Louis Vésignié collection, including the fine gold photographed below. After completing our tour of the new hall, champagne and fine wine were served. We all had a great time until realizing that we hadn't eaten except for hors d'oeuvre. A group of us followed Giancarlo to a French club that was open late and had charcuteries with unlabeled wine. Needless to say a great time was had by all. This month we feature a couple of blasts from the past: two exceptional classics that define aesthetics and rarity in the mineral world. The first specimen is a well perched multi-colored tourmaline on quartz. A fine crystal on its own, this tourmaline displays brilliant pink to mint into evergreen gradation of color. It's very pristine with virtually no damage besides the base. It features an admirable complex termination with gemmy sections running throughout. This bright tourmaline is well contrasted on a nice chunk of quartz. The second specimen is an exquisite benitoite on natrolite. The benitoite crystal itself is huge for the species, 3.5 cm in length. It features a striking trigonal crystal, but a little rough around the edges. This large crystal displays a beautiful color pattern radiating from a white core to brilliant blue edges. To top it all off the benitoite is in front of an equally striking white natrolite background, showing the ideal association of minerals from San Benito County. Many moons ago, and well before the genesis of Pala Mineralis, Pala International's Gabrièl Mattice issued a series of newsletters, The Gem Spectrum, covering a variety of topics of interest to clients and the wider public. We're pleased to offer Chinese translations of the newsletters, courtesy of Yan (Dorina) Shen, a language teacher who studied at Nanjing University. For gemstone aficionados, we offered, via our sibling publication Palagems Reflective Index, American Gemstones and Maw-Sit-Sit. The next in this series is aimed at the mineral collecting crowd: Collecting… It's not just a hobby, which appeared as Gem Spectrum Vol. 6 (May 2000). Because mineral specimens are one of Pala's specialties, we (along with the support of 'Mother Nature') have had a hand in building mineral collections in some of the world’s most prestigious museums. The attendance by Pala's Bill Larson at the opening of France's premiere mineral museum, noted above, also bears witness to these contributions. Collecting Chinese translation by Yan (Dorina) Shen. Click image to open PDF. Koivula and Skalwold to Receive Valentines from "Friends"
"Microworld of Diamonds" is liberally illustrated with the photomicrography of inclusions for which Koivula is famous (see his MicroWorld of Diamonds and Photoatlas of Inclusions in Gemstones, authored with the late Eduard Gübelin). Our favorite from the article is an exquisite graphite dendrite on pyrope, pictured below. This image immediately dispels the notion—as does the text—that blemishes in diamond can be lumped together under the term carbon spots. In short, the authors achieve their goal, stated at the article's end, that "it is hoped that diamond’s fascinating inclusions will be viewed not as a detriment, but as an asset to be treasured as much as the diamond itself." The Best Article and other awards will be presented at the Annual TGMS Awards Banquet, Saturday, February 14, at 7:00 p.m. Congratulations! This brochure is available for downloading and printing. What do conservation groups, off-road vehicle (ORV) clubs, gem-mineral societies and rockhounds share in common? They are joining a growing chorus of voices challenging California's Desert Renewable Energy Conservation Plan (DRECP). What? They're anti-green energy? Really? No. Really, they're not. But they are part of a groundswell that includes nature lovers, hydrologists, geologists, paleontologists, residential communities, small businesses and recreational users of public lands, who share the same concern that the DRECP is a blank check greenlighting the unfettered industrialization of public lands and some of California's last unspoiled wild areas. Says Lisbet Thoresen, San Diego Mineral & Gem Society's editor, "We're not anti-green. We think distributed energy generation such as rooftop solar is a more sensible and economical alternative, creating and delivering energy near where it will be used. DG is sustainable and it does not come at the unnecessary cost of sacrificing the desert to produce and transmit energy to urban areas many miles away." On projects built to date, Thoresen observes,"Project scale, site selection, and unpredictable weather have been critical factors that have made a mirage of creating a green energy oasis in the desert landscape. The natural dust and heat of the Mojave may be intractable obstacles to success, while the impact on wildlife and habitat exacts a disastrous toll." The DRECP is a California state-mandated directive, a 25-year plan focused on developing renewable energy projects (wind, solar, geothermal) in the California desert, an area encompassing 22.5 million acres. Said SDMG board member and American Lands Access Association president Shirley Leeson, "The DRECP has gotten very little input from our community, so if we don't tell the DRECP what needs to be changed in this flawed document, then rockhounds can look forward to being fenced out of collecting areas, and we will become ghosts of the desert." The DRECP is an 8,000-page document. It is much too large and complicated for any one group to review and redress in just 115 days (the comment period closes Feb 23, 2015). Since most people have a dim awareness of what the DRECP is and what its impact will have on them, getting a critical mass of effective comments submitted to the DRECP by February 23rd is a big challenge. Together with other gem-mineral clubs and desert advocacy groups, SDMG is trying to elevate public awareness. SDMG's website has useful resources, tips, and calls to action. Anyone who wants to help get the word out, will find brochures and posters that can be downloaded and printed from the SDMG Press Room or ordered (print-on-demand) at very, low cost from the SDMG online news stand. This poster is available for downloading and printing. Other resources are available here. Wells Fargo Bank has eleven history museums in ten cities, from Charlotte, North Carolina, to Anchorage, Alaska. Last Tuesday, thieves crashed through the revolving doors of the San Francisco museum, making off with about $13,000 worth of gold nuggets. It was what the thieves didn't take that relieved one observer. Robert Chandler, a western history scholar and retired historian for the bank, was consoled that the smashing of the "gold scale case" left the scale itself intact. Chandler told the San Francisco Chronicle that the scale is far more significant than the gold. The bank built its reputation during the California Gold Rush on its authoritative and accurate measurement of the valuable metal. Battered battering ram. The stolen SUV used to gain entrance to the Wells Fargo History Museum in downtown San Francisco was discarded after the heist. (See streaming video here.) This is the fifth robbery since November using the battering-ram method. Of course, the gold in the exhibit was worth many times the $13K it would obtain if melted down. But there's not much possibility it will be offered to collectors. Dealer Don Kagin told the Chronicle that word of the theft already has spread to sellers and their professional associations. The relatively brief, but nonetheless illustrious (and award-winning) collecting career of Gail Copus Spann and Jim Spann received the spotlight by Bryan Swoboda in the December 19 edition of Antiques and Auction News. Beginning with a chance buy of a Sweet Home Mine rhodochrosite in Colorado nine years ago, the Spanns broadened their horizons by visiting the Houston Museum of Natural Science, acquiring a full run of Mineralogical Record, and joining the Mineralogical Association of Dallas, amongst other pursuits. Their collection now numbers about 9,000 pieces and is housed in a tornado-proof (!) vault that features custom display cases complete with temperature control. Swoboda's profile of the Spanns is an inspiration to the budding collector: you have to take that first step. Gail also delivered an engaging lecture last year at Tucson in which she discussed what it was like to be browsing around the Tucson show "as a woman alone—and, boy, was that different from roaming around with Jim." Gail is an advocate of more women's participation in mineral specimen collecting, but her own experience demonstrates why that's not always easy. Gail's lecture was part of a series offered at the Pueblo Gem & Mineral Show. This year's series (Feb. 9–10) features John S. White, Bob Jones, Marco Campos-Venuti, Dr. Don Lum, Dr. Peter Megaw and Federico Barlocher. For details, see the show website (choose the Show Events tab). The Spanns also are active with the Dallas Mineral Collecting Symposium. This year's symposium looks at the minerals of Africa: Tanzania, Tsumeb (Namibia), Madagascar, Kalahari, Morocco and more. Russian miners have found a super-concentration of diamonds while researchers have found that underneath Mars's rust-red dust lies a black beauty. A golf-ball-sized rock from Siberia was featured at December's gathering of the American Geophysical Union in San Francisco. University of Tennessee geologist Larry Taylor and colleagues, who presented the findings, have estimated 30,000 diamonds reside in the stone. While the diamonds are tiny, this concentration is "millions of times" greater than what normally is found in diamond ore (1–6 carats per ton), according to a story by LiveScience. This study contributes to understanding the "birth mechanism" of these diamonds and diamonds in general, Taylor said. From Siberia to Morocco… A 4.4 billion-year-old fragment of the Martian crust was found a few years ago in the Moroccan desert. Only now, after several years of study, is its significance coming to light. "Black Beauty," a meteorite from the red planet, is an amalgamation of rock types and is representative of the "bulk background" of the surface of Mars, according to Kevin Cannon at Brown University, who is the lead author of a study published last month in Icarus. Co-author Jack Mustard, also at Brown, said that Black Beauty may clear up a conundrum whereby the spectral signal of existing meteorites, known as SNCs (shergottites, nakhlites, or chassignites), never matched remotely sensed spectra from the Martian surface. It was close but, "annoyingly," no match. Black Beauty's overall measurement matched the orbital data. Well, we're fudging a bit here; on the RGB color model, violet is opposite chartreuse. Close enough. On the emerald side, we have yet another episode in the legend of the "Bahia" Emerald, which we last looked at three years ago. On the amethyst end we have the proposal for a hotel fashioned in the shape of a giant geode. "Bahia" Emerald: Brazil Wants it Back! A year ago, on January 24, Anthony Thomas was his claim on the "Bahia" Emerald, a specimen that weighs in at 840 pounds, first uncovered in 2001 in Brazil. Thomas is one of eight parties to have claimed ownership of the rock, according to a new story by the Los Angeles Times. Now, as reported by the Times, Brazil is suing for the specimen to be returned, arguing that the rock was illegally mined and exported. Brazil is a latecomer, obviously, not having noticed until notified by U.S. customs enforcement in 2011. After an investigation, Brazil tried negotiating with the U.S.—the specimen resides in a law enforcement vault—for its return. Failing that, the country came to court in Los Angeles County this past September. With Thomas being thrown out of the picture in January 2014, two active claimants remained: Mark Downie, whose complicated claim was reported in April 2013 by Courthouse News Service, and FM Holdings Inc., led by Idaho businessman Kit Morrison, whose case was explained by attorney Andrew Spielberger following the January 2014 ruling. Once upon a time, Morrison and his cohort had the specimen stored in a Vegas vault. Procedures in court resumed last October, with Downie's claim being tossed out by the same judge who disqualified Thomas, according to The Independent (UK). Now the dispute appears to be between Brazil and FM Holdings, whose attorney Spielberger claims the South American country waited too long to weigh in. Amsterdam-based NL Architects have conceived the design of a string of hotels that mimic amethyst geodes. The concept behind the hotel is not just its form. "The Amethyst Hotel is a proposal for a chain of luxury hotels," the firm states, "based on the positive powers of this type crystalline geode." The hotel purports to provide its own draw due to "an almost infinite array of positive effects associated with this seductive gemstone." The architects' slideshow for the hotel then touts "miraculous powers," including immune system boosting, protection of crops against pests, and nightmare prevention—probably not a bad idea for a hotel. The first such hotel, according to the slideshow, is planned for a man-made island in the South China Sea north of China's island province of Hainan. This appears to be fitting, since Will Larson noted in his report on the 2013 Changsha Mineral and Gem Show that Chinese collectors that year were fans of giant Brazilian geodes. And we're reminded of the geodic giants from Uruguay.